The month started pleasantly as the Southeast took one of its rare and short breaks offering a chance to go after a GT right on the 01st. One of the early casts produced a miss and at the next spot another GT chased the popper right to the boat but was despite several attempts either too blind or too stupid to grab it or both. Light jigging around noon was unusually slow with just a few small fish. Managed to hook a Tuna out of a passing school on popper but it came off and later another GT missed the lure in most ridiculous fashion. Total disappointment. 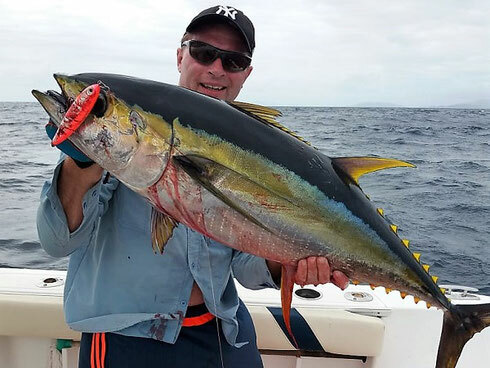 Elsewhere the fish had been much more unerring as I learned in the evening: some boats like Edwin`s Dan Zil caught Tuna in good numbers trolling while Greg picked up a good handful on poppers at the Drop Off along with a Sailfish. Next morning the wind was a bit livelier again but I had to make up for something. Four hours of intense popping at different GT spots raised absolutely nothing though. Jigging was a bit better and this time the sort of daily Tuna stayed on. Not huge but better than none. At 108cm fork length and roughly 27kg an average specimen but of course most welcome. Will dispose of the textbook though and just keep a note that luck is all that matters. The next day the wind was back and apart from a few trolling trips that produced the odd Sailfish and good amounts of smaller gamefish, mainly Tuna, not much happened. Those though are around in such numbers that they are being caught as usually only the Bonitos. 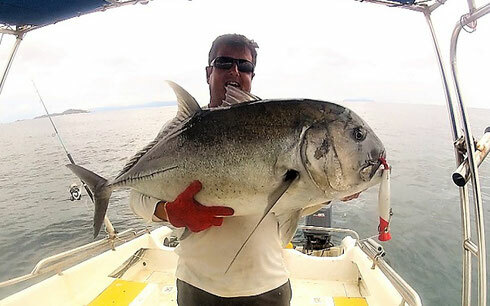 Mervin (Divinity) and a guest in just three hours and only a couple of miles offshore got a dozen on casting lures. And a few days later again in that same area he bagged another 14. Would have loved to pop there but it was far too rough and thus dangerous for going out alone. Had a small technical issue to sort out on top and when done did a test run with a bit of tackle of course. 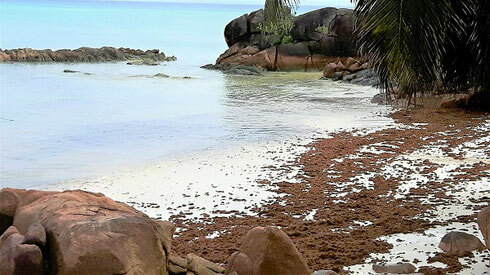 First few popper casts in the La Digue channel raised a large silver fish but it did not come close enough to the surface to tell for sure it was a GT. But have no clue what else it could have been. 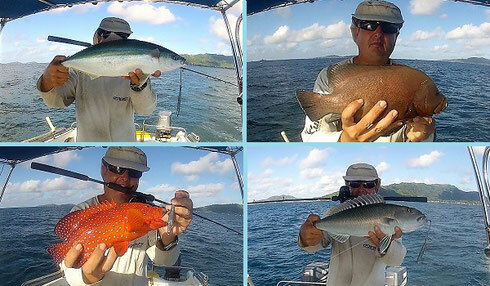 Several drifts with the light jigging gear produced a great mix of fish about everywhere. Nothing really big as a few good ones came away in the strong current but after four hours it had been around 40 fish from impressive 14 different species. 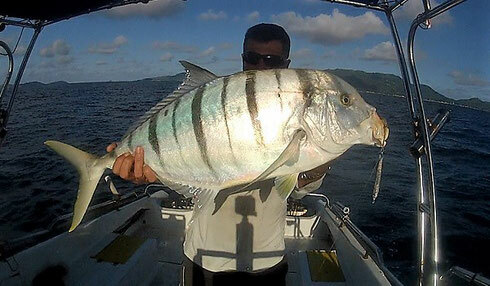 At last also something better turned up in the shape of this not bad at all Golden Trevally. Suspected it actually to be a bit bigger along the fight but this one used the current well to its advantage. Not well enough though. As every year by mid of September hope started to rise that the Southeast might falter early and better fishing conditions might bless us but this went down the drain. Literally more or less as on top of pretty steady 20 knots of wind we got lots of sometimes heavy rain. 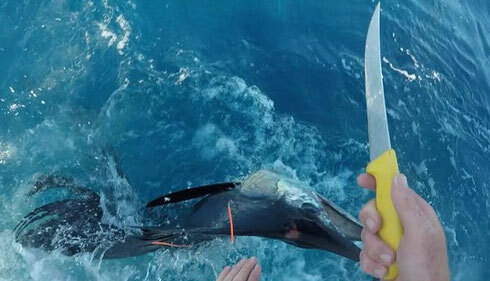 Must have been tough enough even on the large 9G but the team braved the conditions and returned with interesting news: after tagging a Sailfish in the morning they caught and tagged again that same fish about six hours later. Twice it could not resist a trolled Ballyhoo. Of course not all fish are the same but interesting and very convincing proof how little harm a competent release causes. Great stuff. Only around last weekend the wind dropped again a little and things came back to life. 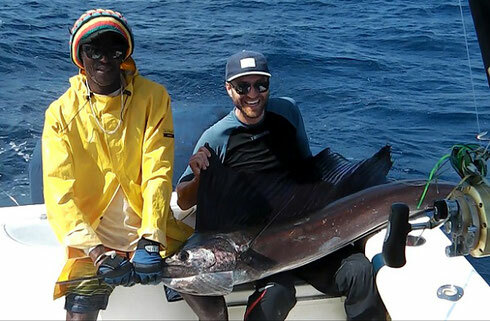 Julien reported one Marlin out of three and the large sailing cat Costa Rica two out of four Sailfish. Out of Mahe the boat Stripper cleaned out a Wahoo nest catching about 30 of good sizes along two consecutive days. 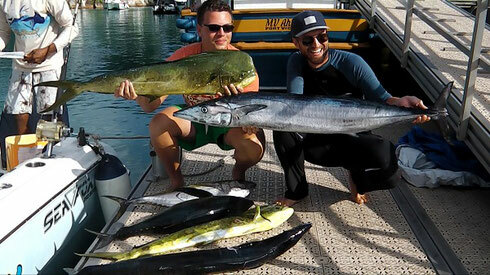 On the 25th Mervin had a half day trolling and returned with a very good mixed bag of smaller Gamefish mainly consisting of Tuna again but a Dorado and a Wahoo in the mix made an Offshore Grand Slam. In those few hours Mervin said they raised about 10 Sailfish but these were all just window shoppers. 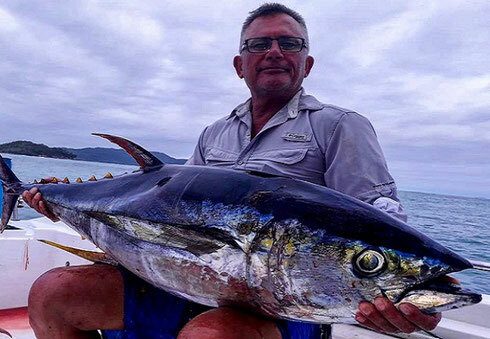 The following somewhat calm day he tried jigging at the Drop but along several hours of hard work they only got a Black Trevally and a Jobfish so trolling and again the Tuna had to save the trip. 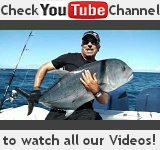 Same time Bruno and Sandro fishing on Aura also caught plenty Tuna, some Wahoos and a Marlin. On the 27th I tagged along with Mervin and German trolling newbies Jannis & Thomas. The wind had returned full strength so getting to the Drop was already tough. Waves got very high around noon as the current shifted into the wind and the biggest one was easy 3.5 meters high. 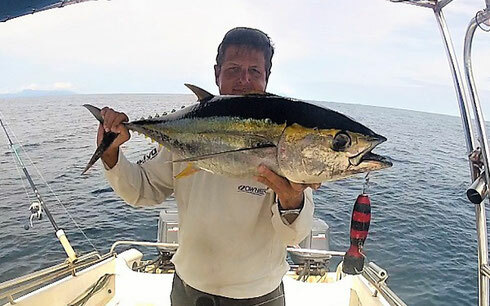 But the two anglers coped well sharing two Tuna, Dorados and Wahoos each among them. That had not been all though as around noon a Black Marlin of about 120kg took but sadly came away a few minutes later. The disappointment did not last too long as later three Sails showed up in quick succession with the last one hooking up. Was of course released after this quick foto. Yesterday it was a bit calmer again and Greg went once more. 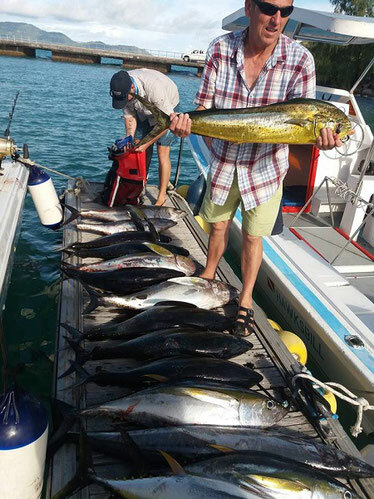 No Sails seen in the area fished but 8 Dorados, 4 Wahoos and 2 Tuna made an entertaining day. The Sails must have been further north as JD (One Love) hooked up with five along his trip losing them all when leaping around. The nice chap was probably not in the best of moods that evening. Not much to tell about fly fishing this time. Went a few times but conditions were at best unfavourable and most of the time all useless. Saw a Bonefish after a long time again on the flat but just for an instant. Visibility is simply too poor to keep anything in sight and sneak into a casting position. The only place offering reasonable conditions at this time of the year remains the bay off my place but it remains hopeless there. Not just all murky by the rain washing soil into the sea but also due to the massive amounts of drifting weeds simply impossible to fish. The strange thing is that this unusual kind of fluffy weed keeps coming in here for months now depsite the offshore wind. So all hopes on October. If all goes normal the Southeast should start to come apart in the course of the month. With a bit of luck this might happen rather soon looking at the big picture forecast. Would be nice to see and enjoy more fishing and doing bi-weekly reports again ideally spiced with some proper popping and jigging stuff. For the preceeding reports check the archive.